For some time I have wanted to visit Scotland and play some of the wonderful golf courses. This was part of a plan I had for my son and I. 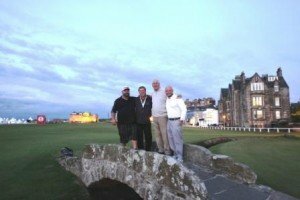 The ultimate intent of course was to play the Old Course in St. Andrews. Knowing that a tee-time could be difficult to obtain, and needing help in all the other arrangements, we decided to leave it in the hands of professionals. We were fortunate to have contacted Graeme at Golf Vacations UK LTD. Graeme was an absolute delight to deal with and everything was completed to our total satisfaction. Ground transport, hotels and tee-times and caddies were all arranged without hassle. We got early confirmation on our Old Course tee-time and this made it very easy to determine other stops on our trip. All four of us who went had a trip we will never forget and so much of this was due to the effort by Graeme and his firm. We highly recommend Graeme should you be planning such a trip.